The saxophone can be regarded as merely the smaller, visible part of an instrument, the more essential remainder of which is hidden inside the body of the performer. Apart from being a perfect vehicle to project everything emerging from his imagination to the outside, this part’s influence on the resulting sound is limited, whereas the invisible parts decide about timbre and tonguing, durations, dynamics and distortion ... But this is just one point of view. Markus Heinze has been exploring the invisible aspects of instrument and performer for over a decade, particularly in his free improvisations and unaccompanied solo work, and meanwhile his saxophones probably did something similar. The result is an extremely personal and surprising aural cosmos, audibly influenced by electronic, percussive and non-musical sounds (without using electronic, percussive and non-musical devices). 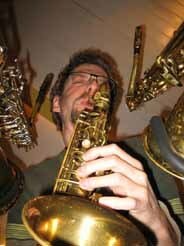 Markus Heinze is a member of Le Fou Rohr saxophone quartet (Munich), the ICI Ensemble Munich, and the saxophone ensemble Rich in Knuckles (Glasgow-Munich); he is also working in other settings between contemporary, jazz and improvised music, and as a solo artist.